Leuze electronic: As the world's leading manufacturer of laboratory instruments and solutions for life science laboratories, Tecan offers efficient automation featuring Leuze electronic sensor systems. Small installation clearances, small module sizes, and fast code reading from a minimum distance – these requirements are always particularly challenging for code readers. To find the right scanner for the detection of sample tubes, their allocation and traceability tailored to their requirements for a multilane application, was at the same time the job and challenge of Markus Wolf. As a senior systems analyst, he has been developing system concepts for the Swiss manufacturer and solution provider for laboratory instruments Tecan for over 20 years. Scanners play an important role in the overall workflow to effectively track samples and thus increase the process reliability. "In the end, the development is always a matter of incorporating the customer's needs in the design input requirements and comparing them with different scanner specifications, so that the best possible solution can be offered to the end user," explains Wolf. Tecan's end customers are, for example, well-known pharmaceutical and biotechnology companies, research departments of universities as well as forensic and diagnostic life science laboratories. A frequent requirement is the ability to integrate a bar code reader into compact analyzers in a space-saving manner, despite their wide reading field. For Tecan, this was a decisive criterion when selecting the BCL300 bar code reader from Leuze electronic for the new automation platform. "In fact, the BCL 300 bar code reader from Leuze electronic was the only device on the market that satisfied my expectations of the reading field," says Markus Wolf. "In addition to the large reading field, another benefit is that numerous special functions, such as software commands and security features, could be flexibly integrated into the bar code reader at a good price/performance ratio." Even the look of the device has been modified to the individual requirements of Tecan. This resulted in a unique, pre-configured scanner, specifically tailored to the needs of Tecan, which received a customized model number and thus was subject to change management approval at Leuze electronic. This means that no software or hardware changes can be made without prior customer agreement, which is essential for certified devices in the field of medical technology. As a result, the customer cannot receive any other device but his own and this for many years, if so desired. "It is also beneficial for us that we will be able to receive our own individual bar code reader, including the circuit board, as a complete package from Leuze electronic," according to the systems analyst. Both, the optics system and the circuit board are made by the Leuze Group: The optics module is manufactured by the optical sensors manufacturer Leuze electronic in Owen. The assembled circuit board and its integrated systems built upon the PCBs are from Leuze assembly, a 100% subsidiary of Leuze electronic. Founded in 1977, Leuze electronic assembly in Unterstadion manufactures printed circuit boards as well as integrated systems built upon the PCBs not only for Leuze electronic, but also for external customers such as Tecan. "Our high level of innovation, the good price/performance ratio and our individually oriented customer support are recognized on the market of EMS service providers," says Sebastian Raible, who has been operations manager of Leuze electronic assembly for one year now. An advanced logistics concept facilitates the combination of a large spectrum of lot sizes with a wide range of variants. The extensive palette of technological services makes Leuze electronic assembly a competent and reliable partner for the mounting of THT and SMT components on flexible or rigid PCBs. Its core competence lies in connection technology on flexible base material as well as in the mounting of fine pitch BGAs, including "Package on Package" (PoP) solutions. Modern testing technologies, such as the flying probe and AOI, ensure the company's high quality standards for optical process monitoring. The fact that this package could be purchased from a single source persuaded the systems analyst Markus Wolf. For this specific multilane application from Tecan's Freedeom EVO® platform, 6 x 16 lanes must be identified, while 6 x 32 lanes for their Fluent® variant. When looking at the projected number of samples, this corresponds to one 96 well-plate for the Freedom EVO® platform and two for Fluent®. The samples as well as the position labels must be read very quickly and simultaneously by the bar code scanner ("fly-by") and allocated to each other accordingly. There is absolutely no tolerance for errors here. Due to its high depth of field, the BCL 300 bar code reader from Leuze electronic, laser class 2, reads these lanes regardless of the order in which the racks are inserted. Depending on the analyzer, this open platform is placed on a worktable with a stainless steel or an aluminum surface. By scanning 32 bar codes and identifying them within three seconds only, the new Fluent ID™-module works extremely efficiently while avoiding waiting and observation times for the liquid handling station. It is equipped with a status indicator, which immediately signals the user a "pass" or "fail" after loading the tubes. In order to ensure completely secure identification of the sample bar codes, Markus Wolf counts on another functionality of the BCL300, which was specifically adapted for Tecan: the geometric analysis of the reflected laser light. With this functionality, the analysis unit of the bar code scanner can precisely determine the horizontal position of the reflex. This allows an exact allocation of the position bar code or the sample bar code. At the same time, a temporal analysis of the reading gate takes place, so that the temporal detection of the sample code can be traced back to a specific position bar code. I.e. : position bar codes and sample bar codes can be checked against each other and thus a secure allocation to the respective position within the sample rack can be ensured. This is extremely important, because the rule for the automation of analysis processes is: no errors are allowed; especially when it comes to the complete identification and traceability of samples in the laboratory. The combination of fast, highly reliable identification with direct feedback and error handling on the Fluent® platform represents an economical solution for the user: compared to conventional automation approaches, this variant saves the end user several days a year in time and thus money. In addition, the Leuze electronic BCL 300 bar code reader offers the functionality of a light barrier and thus enables activation without additional sensors, which minimizes further sources of errors and saves costs. In this variant, the bar code reader points a reduced reflector beam on an opposing reflector while the reading gate remains closed. Only by retracting the racks, the reflector becomes hidden, which then allows the scanner to be activated. Leuze electronic is one of the world's innovation leaders in optical sensors and is internationally known as a leading manufacturer and solution provider in electrical automation. Its main focus is on the areas of intralogistics, packaging industry, machine tools and automotive industry as well as medical technology. The product range includes switching and measuring sensors, identification systems, solutions for image processing and data transmission and also occupational safety components and systems. Founded in 1963, the company, with headquarters in Owen (Germany), possesses specific application know-how as well as comprehensive industry knowledge. More than 1000 employees at 22 locations are involved in development, production, sales and service – supported by more than 40 sales partners around the world. Innovative product developments, tailor-made complete solutions and an extensive range of services stand for the "Smart Sensor Business 4.0" at Leuze electronic. Tecan is a leading global provider of laboratory instruments and solutions for the biopharmaceutical, forensic, and clinical diagnostics industries. 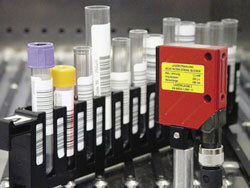 The company specializes in the development, manufacture, and sale of automation solutions for life science laboratories. Tecan's customers are pharmaceutical and biotechnology companies, research departments of universities, and forensic and diagnostic laboratories. As a manufacturer of original equipment, Tecan is also a leader in the development and manufacture of OEM instruments and components, distributed by the respective partner company. Tecan was founded in Switzerland in 1980. The company has production, research and development facilities in Europe and North America. It has a sales and service network in 52 countries. In 2016, Tecan generated revenues of CHF 506 million. (USD 511 million, EUR 464 million) The registered shares of the Tecan Group are traded on the SIX Swiss Exchange (TECN, ISIN CH0012100191).